If you’ve dreamt of your bedroom to be draped in coordinated lines and patterns, but its always been way out of your budget, consider your search to have ended with Varam, a home décor store. Started by Vasudha Jhunjhunwala, Varam is a one-stop solution to all things your home needs in terms of home linen and drapes. A lavish store located in an unassuming building in Goregaon East (to reach the store, navigate your way on Google maps which will take you to Axis Bank. 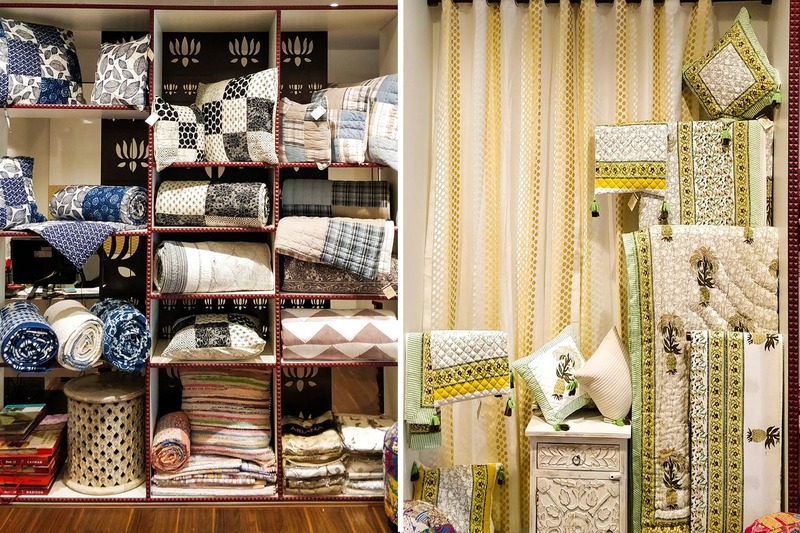 The Store is on the 7th floor of the same building), they create soothing and comfortable soft home furnishings which are handcrafted by artisans in Jaipur. Think cushion covers, bed spreads, dohars, curtains, and beautiful carpets – they’ve got it all. They don’t just make a piece, they weave stories. They focus all their energies in creating coordinated bedroom sets which have everything – bed drapes, throws, curtains, durries, and cushions – all done in a particular colour scheme. Thanks to their affordable prices, you can doll-up your bedroom under INR 30,000. They also weave carpets in all sizes. Starting from INR 6,000 their carpets go up to 5-6 lacs and in terms of material, they range from basic cotton variants to cotton plus silk weave, and also pure silk knotted carpets. While it might sound a little steep, if you’re here, give yourself the liberty to splurge a little and get a full bedroom set that will make your room comfortable and pleasing to the eye. Which then will definitely make your heart and home happy.